Nothing says St. Patrick's day quite like shamrocks. Their shape is a classic symbol of this traditional Irish holiday - each of the three leaves representing the holy trinity. So what could be a better way to celebrate than making these cute shamrock-shaped sugar cookies? 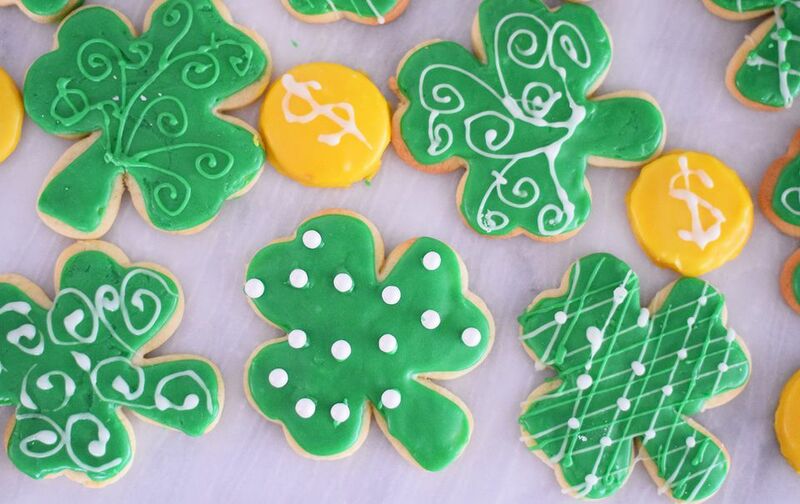 Irish or not, we're sure you can get excited about celebrating this holiday with these adorable green sugar cookies. Add the softened butter, sugar, orange peel, and vanilla extract to the bowl of a stand mixer. You can also use a regular medium-sized bowl and a hand mixer. Blend until the ingredients are creamed together. Sift together the dry ingredients and gradually add them to the creamed mixture. After the dough is combined, divide it in half, wrap in plastic wrap and chill for at least one hour. Place the dough on a lightly floured surface and roll out to about 1/8-inch thick. Cut out the dough using the shamrock cookie cutter. If you are making the coins, we recommend using a small round cookie cutter. Add the cookies to a greased or parchment lined cookie sheet. Bake for about 6 to 8 minutes or until set. Keep a careful eye on them while baking do they do not get over-baked. You don't want them to brown. Roll out dough scraps into another sheet and repeat cutting out the shapes. Allow the cookies to cool slightly on the cookie sheets and then transfer them to a cooling rack to finish cooling. While the cookies are cooling, prepare the royal icing. Beat together the powdered sugar, meringue powder, and milk until completely combined. Separate the icing into three bowls. In one bowl, add 2 tablespoons of powdered sugar. This will be the icing for edging the cookies. Place the icing in a piping bag with a small hole attachment. In the second bowl add the green food coloring and mix until completely combined. Place the icing in a piping bag with a larger hole opening attachment. In the third bowl add yellow food coloring. Add the icing to a third piping bag with a smaller opening. Edge all of the cookies with the white icing. Flood each cookie with the green icing, using a toothpick to help spread the icing to the edges. Flood the coins with the yellow icing. Allow the cookies to completely dry -- it should take 1 to 2 hours. Use the edging icing to add designs to the tops of the cookies and to attach edible pearls and sprinkles to the cookies. You can also thicken the rest of the green and yellow food coloring with more powdered sugar and use that icing to decorate the cookies as well. Allow them to dry and then serve!